A company called Mailtrust (formerly Webmail.us) hosts a majority of my email. I’ve been using them for several months and have been quite happy. I found a recent survey they sent me fairly interesting and wanted to write about it for today. This is really dead simple, but also very effective. It is classic Net Promoter, which is extremely popular among a lot of companies (for good reason). I like how they included a box for any additional comments instead of choosing to do a longer survey. The actual survey, the one you saw once you clicked on the link, looked like the image below. 1. Utilize the technology further. 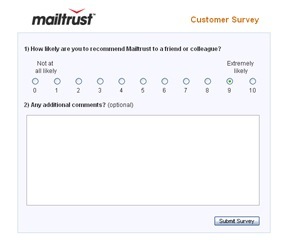 Mailtrust knows if I have HTML email or not and could easily do a form where I can do the rating right from the email. Making it more convenient will make customers happier and produce a higher response rate. 2. On the survey, show my email address. Customers may not feel like their comments are going into a blackhole (a common concern) if an email address was clearly shown under the comments box. I know the company has my email address because it is in the URL of the link I clicked on, but a lot of customers (especially non-technical ones) won’t notice this or put the two together. 3. Offer some sort of award (or possibility of an award) for participating. Inc. Magazine sends me regular surveys and when it sends surveys, it says I have a chance at winning an American Express Gift Card or a signed book or something whenever I participate. I actually won a book once, so I believe in the possibility of it actually happening. If Mailtrust gave away something, it would increase the response rate and encourage even more people to participate in the survey. 4. Include a support / help link. In the email and/or on the actual survey, there should be a link to contact the company directly or at least an email address to contact support. The logo links to their homepage, which subsequently has a link to support, but that isn’t direct enough. Overall, this was a well done survey. It wins a lot of points for simplicity. The next step (one that perhaps Mailtrust can clue us in on) is how they will use the data and what they can do to increase their response rates (and of course, the ratings) next time around. I agree with you about the improvements. I’m familiar Glenn – thanks for the link! Seems like an interesting blog and I think I have his book. Thanks for sharing this – I collect good AND bad examples of surveys on my Survey Idols page (http://customergauge.com/wordpress/?cat=6). Our product CustomerGauge does exactly what you describe – simply measure Net Promoter Score. Interestingly, many companies (despite advice) insist on adding a few more questions! 1. A survey in email: While technically possible, we have found this sort of thing gets caught in spam filters, and may not always work. Best to put in a seperate page we found. 2. On the survey, show my email address: Here is a balance between being Big-Brother-ish and respecting privacy. We have found that leaving customers the option to answer has been the best policy. 3. Offer some sort of award (or possibility of an award) for participating – this one I disagree with. We have found best feedback comes from real “fans” of a brand, or those who are motivated to comment because of poor service. Rewards do not improve quality of feedback, merely quantity. 4. Include a support / help link. Agree – our best practice is to tell the customer they will get an answer in X hours (less than 48 is best)if they leave an email address. Thanks very much for those comments. The information is definitely interesting — I’m glad you came by to share your insights.